Fowler/Bowers Cylinder Bore Gages have been built on the Bowers' reputation for quality... a fast, accurate method for checking bores. Originally designed for engine rebore use, these bore gages have since been developed into a universal, wide range, two point, internal measuring system suitable for many applications. Set the gage with a setting ring or micrometer by rotating the dial face to zero. 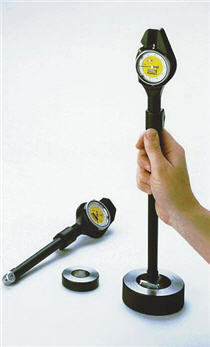 During measurement, the gage is inserted into the bore at an angle and then rocked slowly to enable a reading to be taken. A spring loaded center during measuring operation when the minimum reading gives the bore size.